Binnend, the village associated with a major shale oil works on the north side of the Firth of Forth. There are some wonderful postcard pictures of Binnend from the early twentieth century. For anyone visiting the site of Binnend Jimmy Wilson, now aged 92, who lived at Binnend from 1922 to 1934, will be happy to meet you and share his memories with you. Strathcarron in the Highlands, where the estates of Glencalvie and Greenyard were cleared in the 1840s and 1850 to create sheep runs. In both places groups of women tried hard to resist the evictions but in the end their protests failed. After visiting the estates I met Alastair McIntyre, great grandson of Grace Ross, one of the women who was beaten on the head by a police baton at Greenyard. He told me that Grace used to demonstrate her injury by placing a button in the depression on top of her head. Places on the north east coast affected by shifting sand. These include the medieval village of Forvie and the estate of Culbin, both of which were overwhelmed by sand being blown inland, and Rattray and Findhorn, where moving sand bars cause major problems. The sandbar at Rattray blocked the entrance to the harbour, but the people of Findhorn had time to see what was coming and shifted their village to a safer location further inland. Bothwellhaugh, the village associated with the HamiltonPalace colliery near Motherwell. Much of the village now lies under the water of the StrathclydeCountryPark. Matt Mitchell, Senior Ranger at the park, allowed me to use images from his superb collection of photographs of Bothwellhaugh, including his favourite one, a picture of 14 year old Joe McNamee on his first day at work in the colliery. 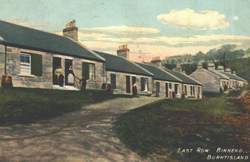 Glenbuck and other small villages in Ayrshire that developed to provide accommodation for coal miners and their families. Glenbuck had a most extraordinary record for producing footballers, 50 professional players including seven Scottish internationals. One of them, Bill Shankly, became a celebrated manager of Liverpool FC. If you want to look at these sections a good place to start would be www.abandonedcommunities.co.uk/page140.html.